Traveling to different destinations comes with some health risks. It’s difficult for some people to feel fresh, relaxed and rejuvenated when flying long distances. It is ideal to prepare as much as you can for the trip. For instance, getting a good night’s sleep and eating a light meal before your flight will help you cope well with the demands of your journey. Doing some gentle exercise also helps if it’s done before the flight. On longer journeys, low cabin humidity can cause dry eyes, nose, and throat. Drinking plenty of water and fruit juice helps your body to be hydrated. On that note, keeping to a minimum the alcohol, tea, and coffee as these can lead to dehydration. Applying skin moisturizer and lip balm helps your skin retain some moisture and avoids dry skin. Keeping your blood circulation going by standing up and walking down the aisle is significant. You can take some simple stretching exercises in your seat every few hours. This will enable you to feel fresher when you arrive at your destination. You can flex your different muscles such as those in the legs and arms. Sluggish circulation causes tiredness, muscle cramps and water retention that causes swelling of feet. When traveling across time zones your body’s sleep rhythms can become disrupted leading to insomnia. Other effects include loss of appetite and fatigue. Prepare your body clock by getting a good night’s sleep before your flight. Try to give yourself a couple of relaxed days to adjust to new night and day cycles when you arrive. Here are some of the 15 best cabins to fly business. 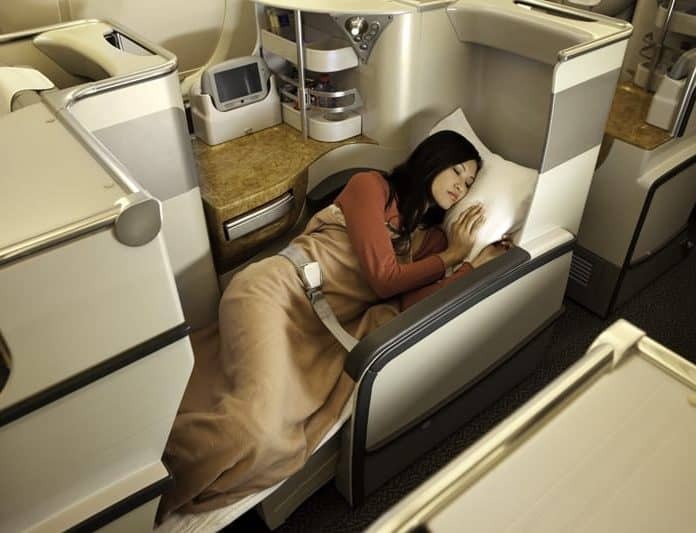 The A 380 has some of the best business class features that will make you flying comfortable and memorable. It has two business class cabins that take almost the entire top deck of the airplane. The first one has 11 rows of seats and the rear one has seven. There are eight seats in two rows at the very back of the plane. Each row has four seats in a staggered 1-2-1 formation. The even-numbered rows have side seats that face in the forward position and have wide armrests. The middle seats in even rows have armrests on the aisles separated by narrow dividers between them. The middle seats are odd-numbered on the aisles and are rear-facing. Their armrests are thin separating them from the aisle. They are great when traveling as a couple or with a colleague. The rear-facing seats are 73 inches long and 20 inches wide. They have an upholstered seat cushion and backrest with a beige fabric. The headrest is covered in leather. The thick armrest has buttons to control seat positions. The front-rear facing seats on the side contain a handheld control to manage the in-flight entertainment. You can also control the light. The touchscreen buttons control the seat, cushion firmness and lighting. The business-class seats have a large 18-inch IFE screens. The airline provides you with headsets to cancel out the noise. They give you pre-departure drinks that include water and champagne. There are normal meal service times but you are free to order from the all-day menu at any given period. The meals have starters, mains, and dessert. The beverage menu contains non-alcoholic options that include coffee drinks and a selection of teas. Wines and other beverages are provided as part of their alcoholic drinks.